In the nearly three years that we’ve lived in our house, I have managed to give most of the interior some TLC. 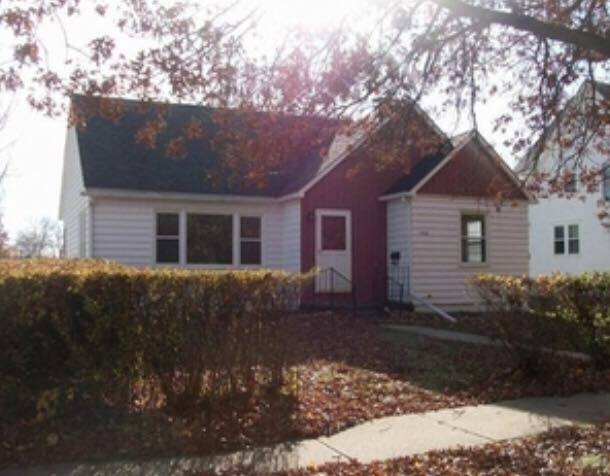 As for the exterior, well…that’s a whole different story. One of my house goals for this year was to amp up our curb appeal since we had barely touched our front yard so far. 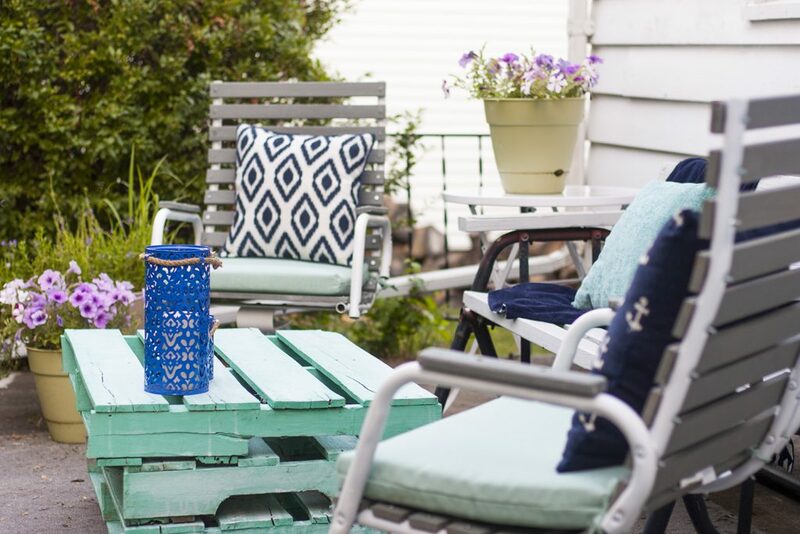 I’m so excited to have some before and afters of our front patio makeover and curb appeal projects to share with you today! The yard was in poor shape, that’s for sure! The extent of our front yard work until this year has included keeping the lawn mowed and raking up alllll of those leaves every fall. We’ve trimmed the crazy line of bushes a few times, but I’ll admit that’s an easy project to procrastinate. It wasn’t terrible, but there was definite room for improvement. The bushes needed to be tamed, the steps needed repairing, the concrete patio needed a purpose and the house in general needed a good cleaning. 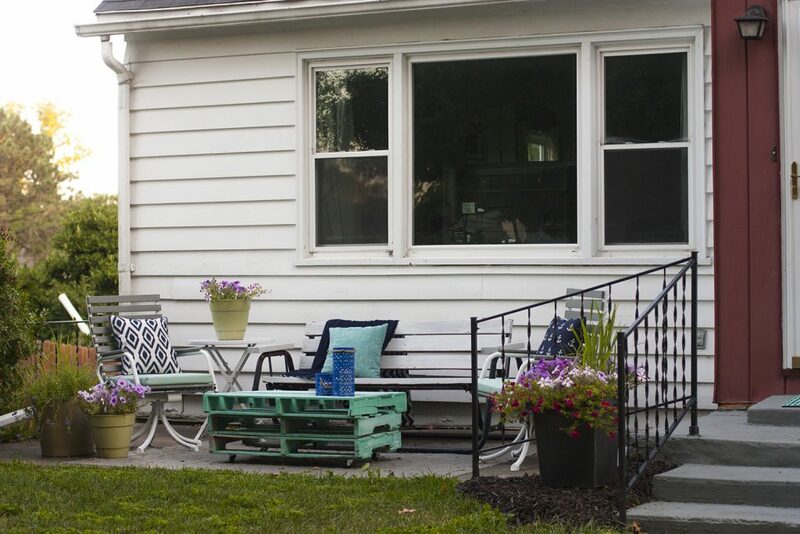 Things out here are definitely not perfect, but I was able to drastically improve our curb appeal and decorate our front patio on a very small budget. 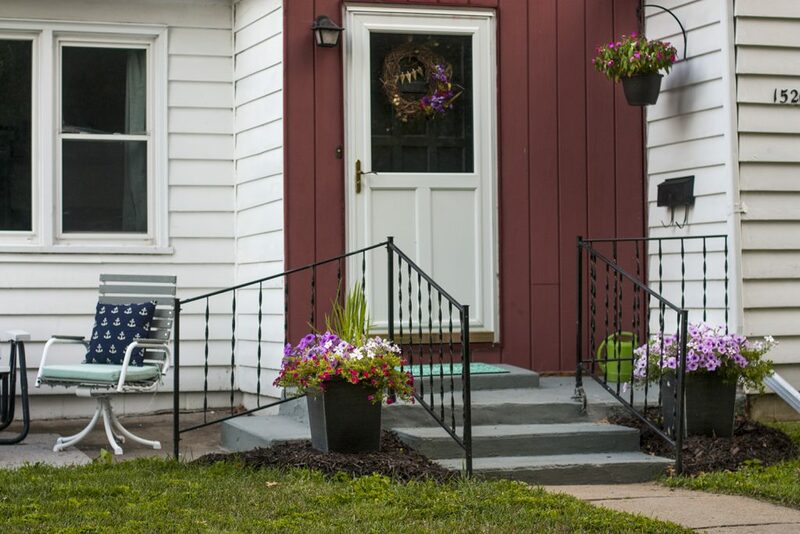 The front steps were in desperate need of some attention. 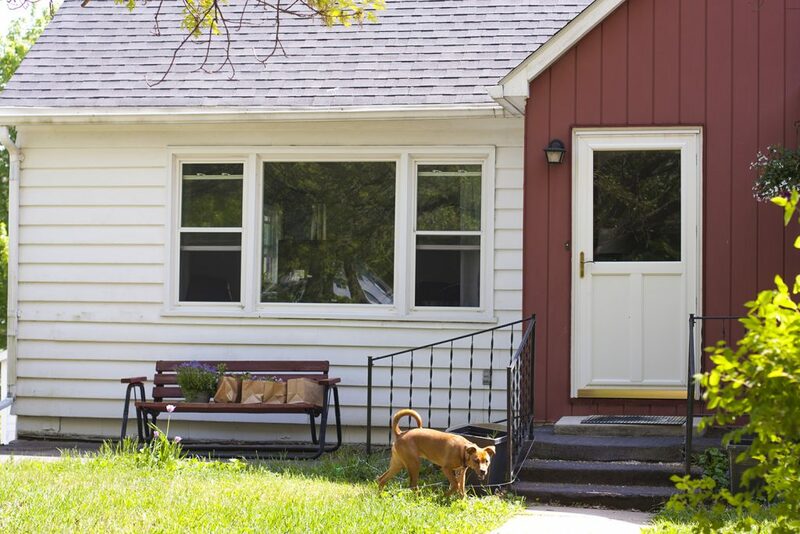 When we purchased this house, one of the repairs we asked the sellers to take care of was adding another step because the existing ones had settled so much that it was a large step up into the front door. Well, we got our extra step but it hasn’t really looked great since. They literally cut a hole in the worn outdoor carpet and added a cement step. 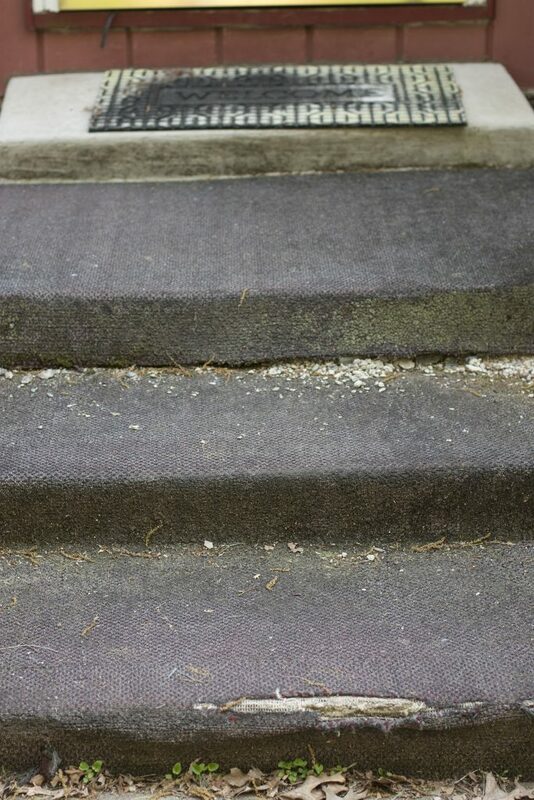 Until this summer, we’ve lived with grungy outdoor carpet and a welcome mat that sort of “disguises” the bare cement of the top step. 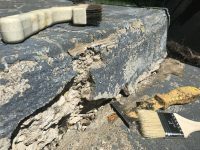 I’m going to write an entire post with before and afters of my front step project, so, for now, I’ll just say that the cement was crumbling pretty bad underneath that carpet. 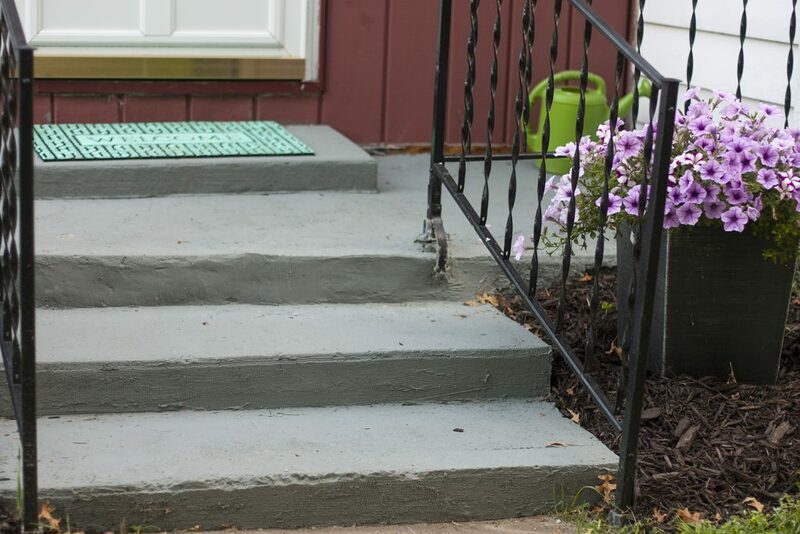 I patched the steps with new cement, filled in the cracks with cement caulk and painted over all of them with patio paint. They look a million times better now! 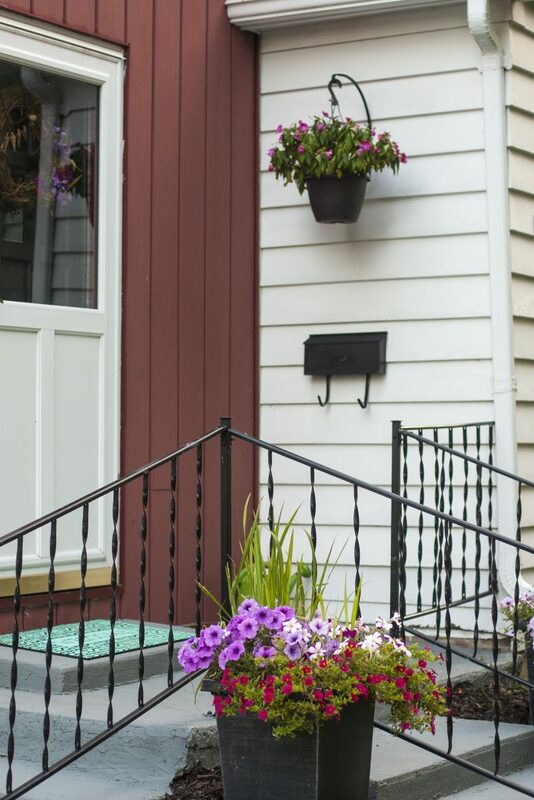 I touched up the black mailbox and railing with new black paint, hung up a pretty hanging basket of flowers, made a simple wreath for the front door and added a cheery welcome mat. 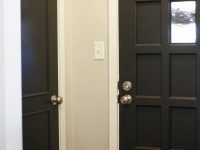 The red front door also got a coat of sleek black paint and new hardware, which I’ll show you more of in the next couple weeks. The grass never grew in the corners by the railing, so my mom had the brilliant idea to add some mulch there to hide the bare dirt. 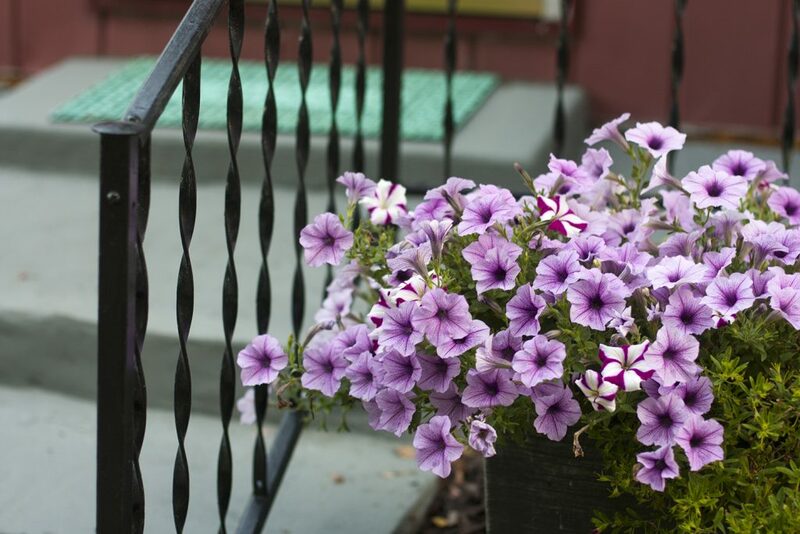 This was an easy and cheap way to spruce things up before prospective buyers tour the house. I simply poured a big bag of mulch on the ground and set tall flower planters on top of it. I’ve even managed to keep the flowers looking great despite the crazy hot heat here in Iowa lately! 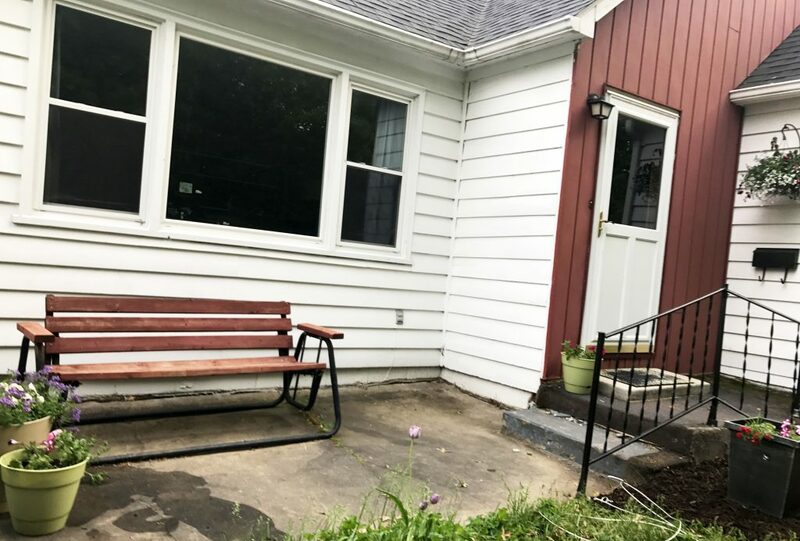 There’s a cement slab to the left of the front door and it hasn’t had as much as a chair on it until last fall when I set my grandma’s old bench swing out there. 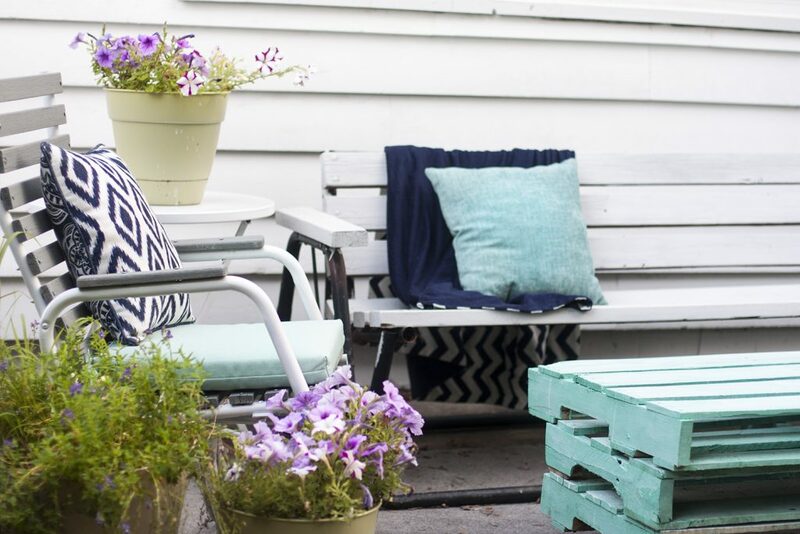 I already shared some great sneak peeks of the patio in this post a month ago. 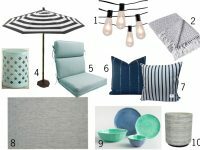 I refinished two garage sale chairs (before and afters in this post), created a simple coffee table with pallets and added a neutral outdoor rug to cozy things up a bit. It is so nice to have a cozy seating area out here now! I really wish I would have gotten to this project earlier because I’ve been enjoying so many evenings out there this summer. David helped me wash the siding and windows so things look a lot cleaner. More on that project in this post. You’ll also notice we finally bit the bullet and spent a hot day trimming that crazy hedge of bushes. I’ll give David the credit for this project – all I did was hold the ladder and pick up a few branches. There were also a few random bushes on the other side of our front yard that our new neighbor kindly removed. I also spent a couple minutes pulling weeds from the cracks in the sidewalk and David used our trimmer to neatly edge the sidewalk. Those projects were super easy, but things you don’t always think about and they can make a big difference. 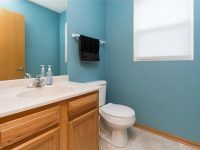 It really is amazing what you can do to improve your home when you put some effort into it! 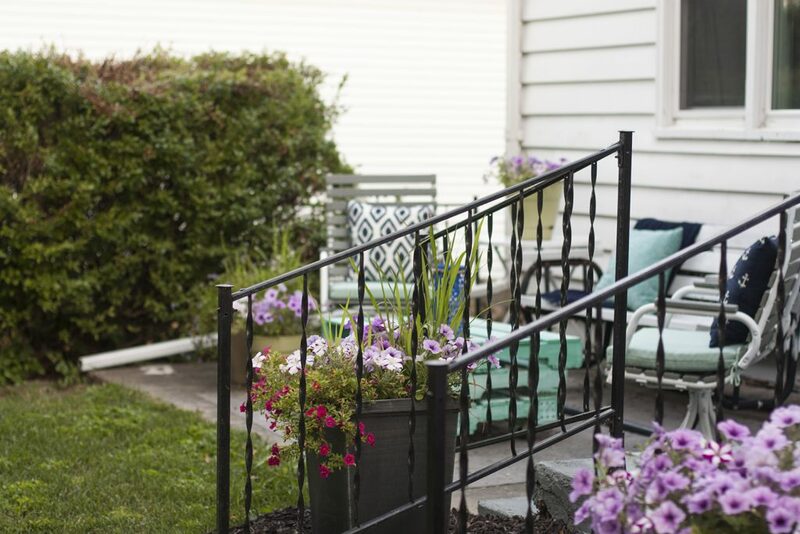 These curb appeal projects and front patio makeover weren’t all that difficult or expensive. 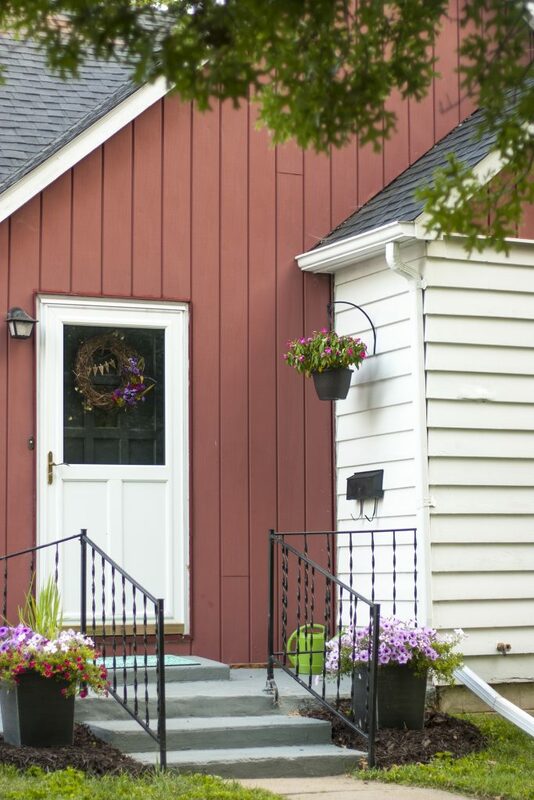 What types of cosmetic updates can you make to the front of your house? 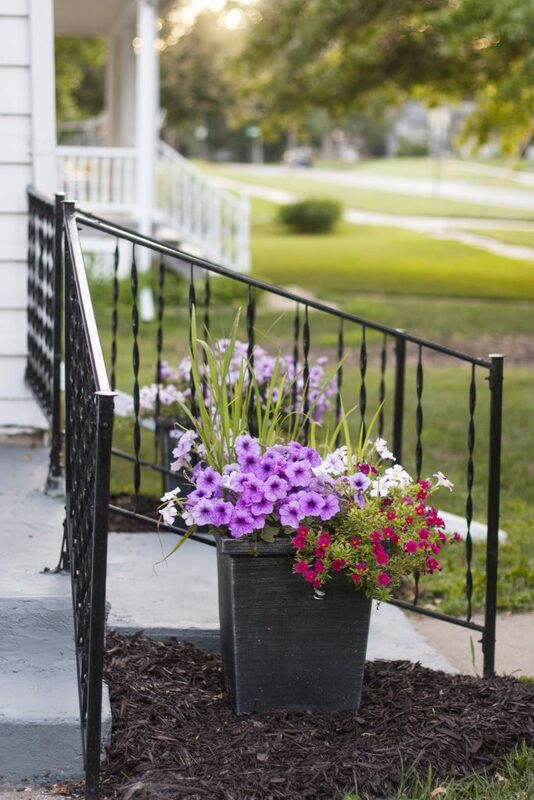 Do you have any curb appeal projects planned this summer?